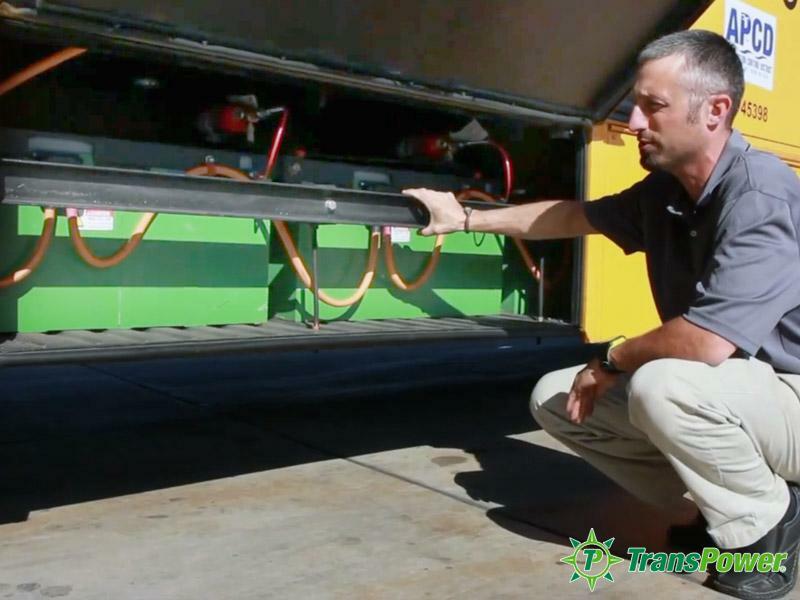 TransPower’s ElecTruck™ components provide a clean and safe propulsion alternative for a wide range of school bus applications. 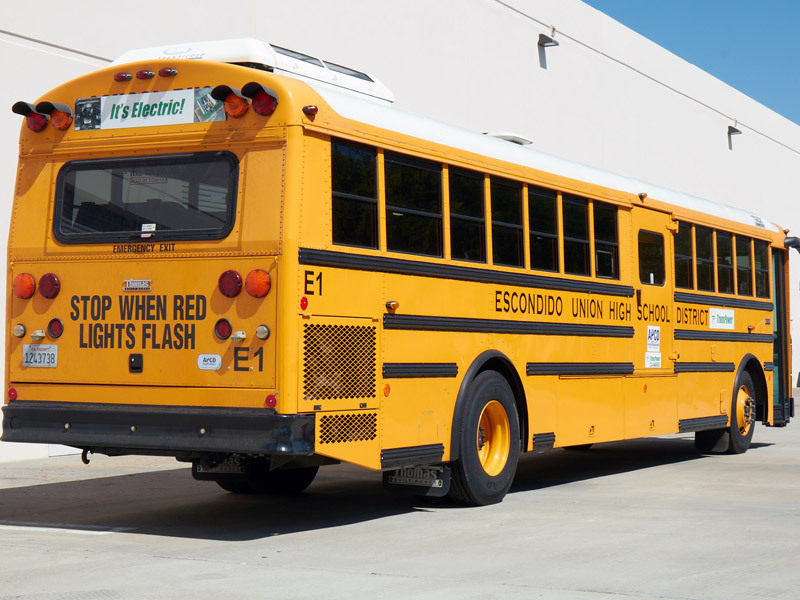 TransPower converted its first school bus, a 40-foot Thomas Built Type D “Transit Style,” in 2013 which was approved for student transportation use by the California Highway Patrol in early 2014. 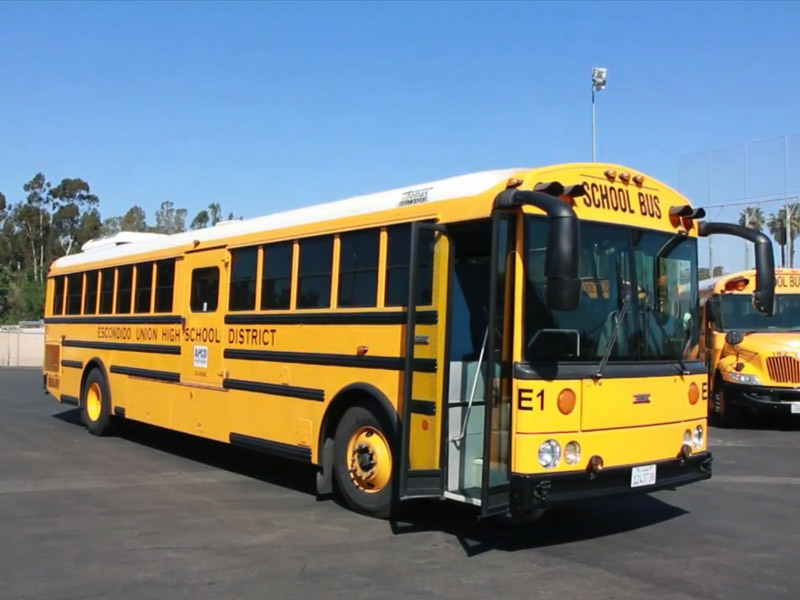 This bus was used successfully to transport high school students in the San Diego area during the spring of 2014. Since then, TransPower has built six more Type C busses with more in the production queue. These buses utilized the ElecTruck™ 5-speed AMT which tackles difficult steep off curb launches while retaining the ability to cruise at highway speeds in excess of 70 MPH. A Class 8 heavy duty Type D transit school bus with the ElecTruck™ powertrain can achieve over 100 miles of highway range and more in typical stop and go driving. With demonstrated Class 6 – 8 zero emission school bus conversions, TransPower continues to work with North American school bus manufacturers for the next generation of factory built all-electric school buses with ranges estimate at over 150 miles with charge times as little as one hour. Continuing to exhibit vehicle 2-Grid technology, school buses help support the overall school district site energy and power load while furthering the operational cost and savings to the district beyond fuel and maintenance cost reduction. Follow this link to download the report on TransPower’s electric school bus project. I am counsel to the Environmental Protection Committee of the New York City Council. We have the largest population of public school students in the entire nation and we are hearing legislation that would direct us to transition our school bus fleet from diesel to electric. I noticed on your website that you make electric school buses. It would be great to have you testify at our public hearing about electric school buses. The information about our public hearing is indicated below. We were unable to locate and email address for you. Please let us know if you are interested in working with New York City on this important issue. Please be advised that the Committee on Environmental Protection will hold a hearing on Monday, December 17, 2018 at 10:00 A.M. in the 16th Floor Committee Room at 250 Broadway regarding the above-referred topic. You are hereby invited to attend this hearing and testify therein. Please feel free to bring with you such members of your staff you deem appropriate to the subject matter. If you plan to participate, it would be greatly appreciated if you could bring twenty (20) copies double-sided of your written testimony to the hearing. I would appreciate receiving a response from you as to whether or not you will be able to attend.